C.N.R. won first half pennant, Elks captured the flag in the second half. C.N.R. won the playoff final. The Moose Jaw Club won the league title defeating the pennant-winning Elks in the playoff final. While semi-pro teams from the southern part of Saskatchewan were heavily involved in tournament and exhibition action with their counterparts from Montana and North Dakota border towns during the summer of 1925 (see the game reports section for news on John Donaldson, Swede Risberg and Happy Felsch) things were much different further north in the province. Within the confines of Saskatoon, senior level baseball at the amateur level held the spotlight. After falling behind three games to none with one game tied in the Saskatoon City League playoffs, the Saskatoon C.N.R. team won four straight games from the Saskatoon Elks to take the Hub City title and a berth in the provincial finals. Webb Bird, a transplanted Reginan, playing his second season (of three) in Saskatoon before returning to the Capital City, won the 1925 batting crown although his team, the Elks, failed in their attempt to cop the intra-city laurels. Expecting a playoff from Regina and Moose Jaw for 1925 amateur laurels, the Bridge City Railroaders, instead, backed into the provincial senior title when neither of the southerners put forth a challenge. The August 28, 1925 edition of the Saskatoon Phoenix suggested that Regina and Moose Jaw were far more interested in tournament and exhibition commitments to the inevitable neglect of their respective city league schedules and that several players, not quite good enough for all-star company, were forced into comparative idleness. Playoffs : In a tightly-fought series which began as a best-of-five affair, the second-place Moose Jaw Club entry knocked off the pennant-winning Elks Club in seven games, winning three and losing two while two games were tied. Outfielder Mel Kerr became the first Saskatchewan player to reach the major leagues. Born in Souris, Manitoba, Kerr grew up in Saskatoon and became one of the province's most outstanding all-round athletes. After leading the Saskatoon City League in hitting in 1924, with a .435 average, Kerr was signed by the Chicago Cubs and was a September call-up. He played in just one game, as a pinch-runner and scored a run. Kerr had a solid minor league career ended by a shoulder injury in the early 1930s. 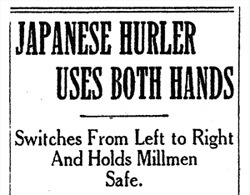 In baseball, one of the rarest feats is having an ambidextrous hurler -- both a righty and a southpaw! In 1925 there was word of one, playing for a feeder club for the famous Asahis of Vancouver. G. Sarayama attracted the notice of the local paper, the Vancouver World, as he pitched the Mikados to a 10-4 victory over Hanburys in Senior B action at McBride Park on May 13, 1925. Sarayama was the centre of interest as he pitched with his left hand for the first three innings and before the fourth, warmed up with his right. When Stan Clark knocked a two-bagger on a lefty delivery, Sarayama changed hands and allowed only one hit the rest of the game. In the seven-inning contest, he allowed seven hits, fanned six and walked a pair.